Among many innovative and popular products that were made in the development house of the Google, Picasa Web Albums distinguishes itself as one of the best services for image lovers. This great image sharing service allows you to upload all of your images into safe online environment no matter how many pictures you have. 10 or 10 thousands, Google powerful servers will manage to support them all. Share your photos today! Free version of Picasa Web Albums offers you generous free storage of 1GB, which will be enough for you to test this service and all the great tools it offers. All of the content that you upload there will be securely stored and backed up, so you never need to fear that you will lose anything. Picasa Web Albums is one of the best photo sharing and storage services in the current market, and if you are true photo enthusiast, you simply must try it! Image sharing is something we all like to do, but image backup, online storage and very simple uploading is even more important to the people who have large image collections or are in the process of building that collections. Sharing images online is more and more easy these days, and users have flocked to the services that offer not only great interface, but also integration with many other secondary image-related tools. One of the best places where you can get truly all-in-one service is Picasa, image service that is owned and managed by Google who was integrated Picasa into its standard online offering of services that are accessible for free using their Google Account system. This allows users from all around the world to effortlessly manage large image galleries, sharing, tagging, editing and more, all directly managed from inside their browsers without the need to install any plugin or add-ons. Share your photos today! 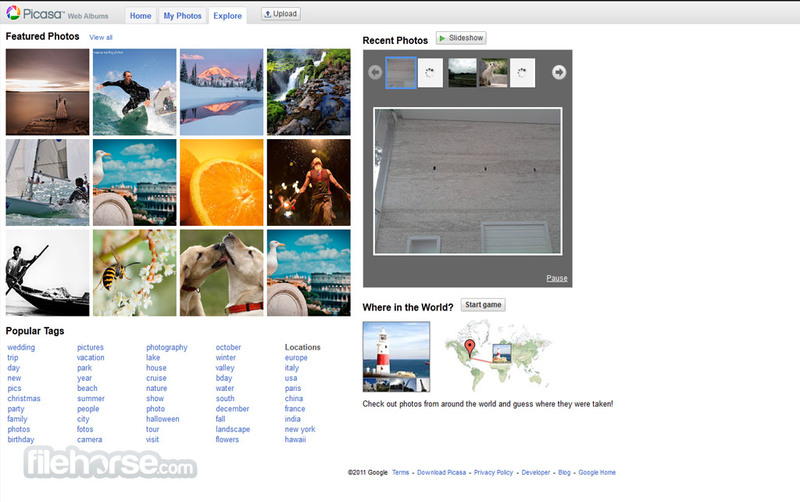 Picasa is the official image hosting, viewing, organizing and sharing service of Google, internet giant that has today after years on the market integrated this service directly into their popular Google+ social network. By being present in the ecosystem of Google apps by more than 10 years (and additional two under the ownership of original creators), Picasa managed to evolve quite the much, offering great service to both offline image collectors with the standalone application for Windows and Mac OS X, and integrated support for cloud backup, uploads, management, access from any supported device (computers, smartphones and tablets), and single click sharing. In addition of offering image upload and storage capabilities that are enhanced with the full support for image tagging, Picasa also hosts a integrated image editor that can enhance your old photographs with many attractive and eye-catching filters which were highly popularized over the last few years with Instagram. Picasa can be accessed using same user account credentials as all other Google services (Gmail, YouTube, Google+), enabling several billions of Google users direct access to the 15 GB of storage that is shared between Google Drive, Gmail and Picasa pictures (Google+ Photos). However Picasa images will be counted to this storage limit only if their size is larger than 2048x2048 pixels. All images that are smaller than that will be hosted for free, no matter how many of them you wish to archive online. As all Google services, and especially after integration into Google+, Picasa has that recognizable Google interface that enables effortless manipulation of all tools, services and content that is showcased on the screen. 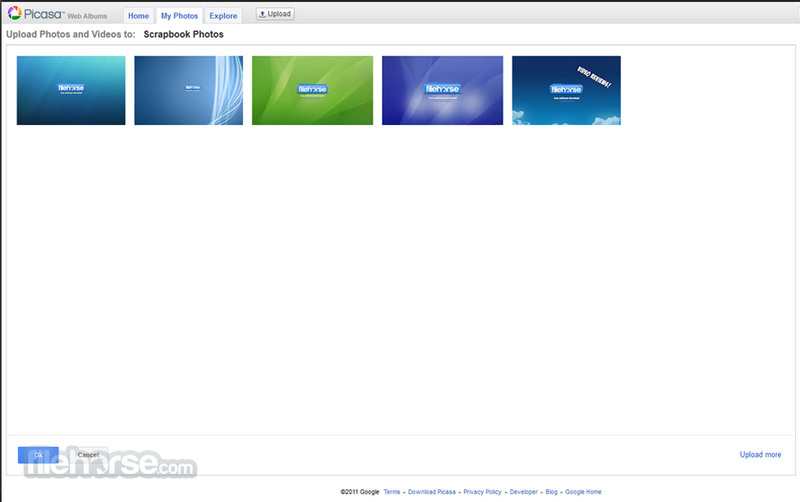 Made to be intuitive to novices and versatile for professionals, interface of Picasa can hardly be improved. 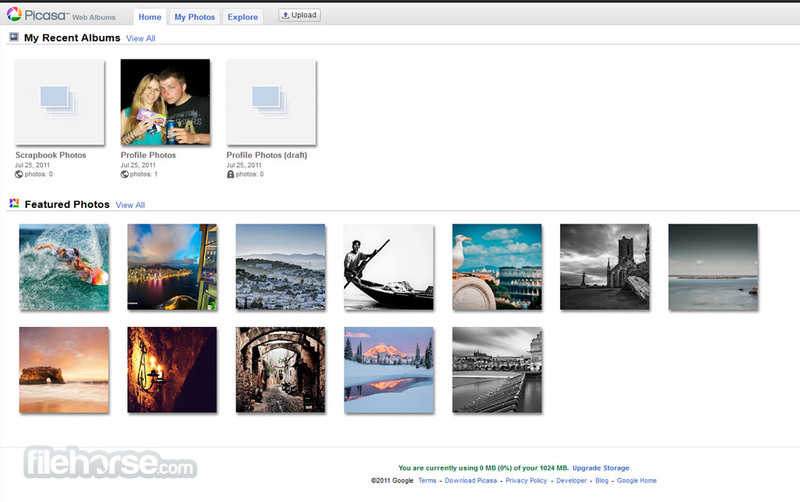 Picasa is free for use for anyone who has Google Account. The only payments that can be asked from you are in case that you fill out 15 GB of free storage that is shared between Picasa, GDrive and Gmail (only images that are larger than 2048x2048 pixels are counted though). Increase from 15 GB to 100 GB of storage costs $1.99/month, whole 1 TB costs only $9.99/month. Share your photos today! Picasa is without a doubt one of the best image organizer, viewing, backup and sharing site in the world, taking full advantage form the deep integration into many other Google services.